Lee’s Summit, Missouri is a wonderful suburb of Kansas City and made Money Magazine’s list of the “Top 100 Best Cities to Live in in the United States,” in addition to being ranked among the “Top 10 Happiest Places” in the state of Missouri. For years Lee’s Summit has been a popular destination for homebuyers looking to relocate in the Kansas City Metro area. Homes for sale in Lee’s Summit come in a number of distinct and remarkable neighborhoods and subdivisions, and Ridgewood Hills is one of them. Ridgewood Hills is a splendid community with homes for sale in a variety of styles and sizes. There are numerous floor plans from which to choose and home styles include ranch, multiple split level options, 1.5 and 2 story homes. Homes for sale in Ridgewood Hills vary in price depending upon the floor plan, age, location, and special features of the property, but typically range from $150,000 to $225,000, with a median listing price of $199,950, or $78 per square foot. Ridgewood Hills is a great place for retirees, young professionals and families alike. 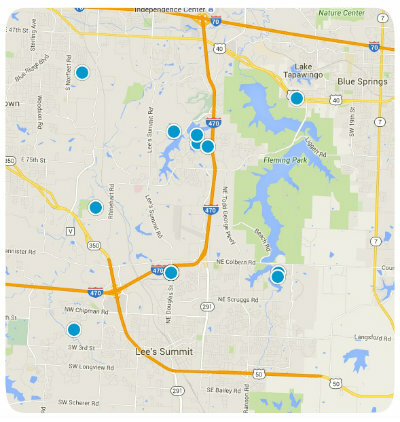 Students that reside in Ridgewood Hills attend in the prestigious Blue Springs School District. This wonderful community has an active HOA. Because of its great location, residents of Ridgewood Hills can easily enjoy all of the exciting attractions of Kansas City, as well as its excellent shopping, dining, entertainment and recreation. If you would like to buy a home in Ridgewood Hills of Lee’s Summit, Missouri, please do not hesitate to contact us today.